Thomas Williams, a London South Bank University (LSBU) Digital Media Arts graduate and co-founder of start-up Falcon DHQ, and business partner Benjamin Weld have secured a place on Property Innovation Labs (Pi Labs) Accelerator, Europe’s first venture capital platform investing exclusively in early stage property tech ventures. 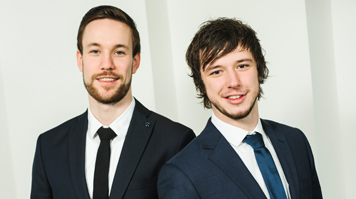 The Pi Labs scheme is a 13 week intensive accelerator programme giving Thomas and Benjamin the opportunity to develop their paperless security product through investment and brand awareness. It will also give the LSBU former students access to some of the highest rated mentors in London and will expose their company to a range of well-connected, industry-wide experts. Find out more about Student Enterprise activities at LSBU.